Throwback photo of our first scrub recipe! Did you know when scrub me™ started as a company in 2013 we only had two types of products? A sea salt body scrub with added botanical ingredients and our ever popular whipped shea butter. These products were created because we felt we needed to put more of an emphasis on taking care of the skin on our bodies, not just the face and neck! We want to pamper all parts of our skin to keep it healthy, clear, and radiant. Cleansing, exfoliating, and moisturizing your body with great products at home is super important. But, there are a few in spa treatments you can treat yourself to that will take your skin from good to glowing! Just like a typical facial except it's for your back! This hard to reach area is cleansed, exfoliated, steamed, cleaned with extractions, and masked. Like a regular facial, a small consultation is performed prior to the treatment to assess what type of products will be best. All skin is different so we do a consultation to make sure we get the best results from the facial. scrub me secret: skin on the body is typically more resilient than the skin on our faces. this means your esthetician is able to use a heavier or more aggressive exfoliant vs. what they would use on your face. A back facial consists of five different steps: cleansing, steam & exfoliation, extractions, mask, and aftercare products. Sometimes, depending on what the skin needs, there may be a double exfoliation or some extra healing treatments like LED light therapy. Do I need a back facial? This treatment is great for all skin types. Back facials paired with the correct body products can help clear acne and prevent it from returning. Even if the client doesn't have acne or active breakouts, they can still benefit from a back facial. Dry skin will be removed, small blackheads that have gone unnoticed will be extracted, and a mask tailored to your specific skin type will be applied. Antiaging, hydrating, and brightening masks are all great options! Your skin will feel healthier and more radiant than ever before. This is a perfect treatment for weddings, events, or outdoor parties where you'll be showing some extra skin. scrub me secret: have a facial wash that was too harsh for your face? maybe an acne wash that was too drying? don't toss these items, use them as a body wash! your more resilient body skin should be able to handle these products much better than your facial skin. if your skin is very sensitive we suggest trying a spot test on a small part of your body like inner arm or thigh to make sure your skin doesn't react. What to expect from a body peel. A body peel treatment helps the client achieve results that can't be accomplished with at-home care, body scrubs, or facials. While some brightening, retexturizing, or firming may come from one body peel, it is usually suggested that clients get multiple peels over the course of weeks or months to achieve best results. The treatment usually takes about 30min-1hr depending on the size of the area that is being peeled. Price also varies depending on what body part is being treated. Your esthetician will walk you through the treatment before and during the process. While peels are not as relaxing as a common spa treatment there should be no pain and very little discomfort. Remember, peels should always be administered by a licensed professional. scrub me secret: There is an array of peel options from various skin care lines. 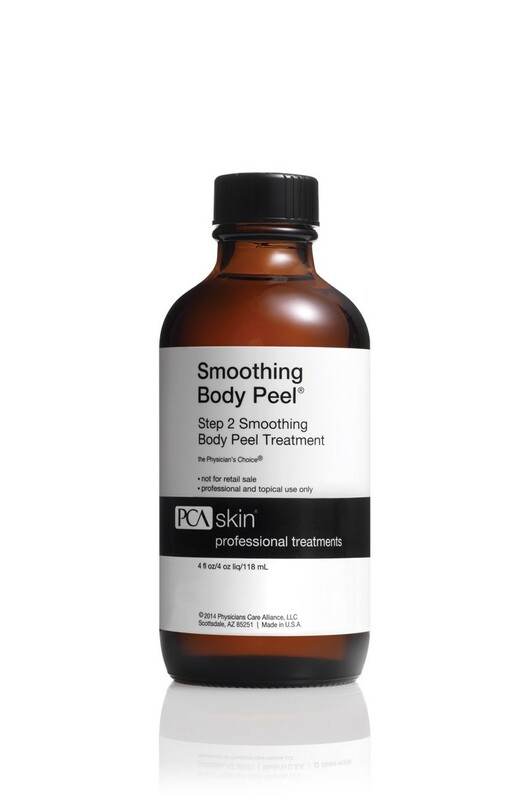 scrub me™ skin care in Chicago uses PCA body peels. We find the ingredients to be effective, high quality, and safe for skin in small doses. What does a body peel help treat? Certain skin care concerns like keratosis pilaris (small bumps), stretch marks, acne scarring, and pigment from sun damage are better treated with a body peel vs. a scrub or mask. Ingredients like lactic acid, trichloroacetic acid, salicylic acid, and glycolic acid work to retexturize skin, turn over cells, and lessen oil production. These ingredients will help the clients skin purge skin cells and make room for fresh, healthy ones. They also help break down congestion, oils, and dead cells stuck in the pores. These peels have other added ingredients like kojic acid and different antioxidants that boost the brightening and skin strengthening effects of the peel. The goal is to treat the issue and essentially reset the skin to make the barrier balanced and strong. Why everyone should get a body scrub at least once in their life. A full body exfoliation performed by a trained technician is definitely a one of a kind experience. Out of all the body treatments, this is by far the most relaxing. Not to mention, your skin and body will greatly benefit from it! Every skin type, with the exception of active acne all over the body, can be a great candidate for a body scrub. Using a dry exfoliation method or an exfoliating product, your technician scrubs your whole entire body for you (sans your most private areas). Don't worry, you will be properly draped with sheets or towels throughout the process so you won't feel bare or uncomfortable. Then, the client is either rinsed off with a shower or Vichy shower or wiped down with hot towels. After this, a moisturizer of some kind is massaged lightly into skin. It's like getting a mini massage! You will feel relaxed and refreshed afterward. Skin is exfoliated using a dry brush or textured exfoliating gloves. Benefits of this method are a slightly deeper exfoliation vs. a salt or sugar scrub, lots of circulation promotion, and you won't be getting completely wet if that's not your thing. scrub me secret: we've found that a dry exfoliation method is best for removing leftover sunless tan. it seems to help buff away the residual product more easily than when skin is wet. After the dry exfoliation, the client is usually wiped down with hot towels before moisturizer is applied. scrub me™ sea salt body scrub. This type of body scrub treatment uses a physical product, like our sea salt body scrub, to exfoliate the body. Before and after the scrub, the client is treated to a soak or Vichy shower to prep skin and then to remove the product. This is a fun, relaxing experience. scrub me secret: a Vichy shower is a shower that uses many different shower heads to rinse the client off while they lay and relax on a wet bed. a wet bed is like a massage table only with drainage for excess water. this shower is used to prep the skin before scrub treatments and to rinse off product from the skin. essential oils can be used for aromatherapy while the warm water creates steam. Benefits of this body scrub are detoxification from salts (if salts are used for exfoliation), added nourishment from oils in the product, and aromatherapy benefits during the treatment. First, the clients are either rinsed with the Vichy shower or invited to soak in a soaking tub. Then, the scrub product is applied to the body and scrubbed in methodically. Exfoliation can be lighter or heavier depending on how much pressure and product is used. After, the client is rinsed or soaked again to clean the skin and provide relaxation. Some treatments include hydration afterward and some do not. You will feel amazing, relaxed, and soft as can be!